Are you going to TC!6? Do you want to connect to fellow TUG leaders while there? So far, 100 of us filled out Jordan Scott 's Google sheet to indicate we're attending TC16, and name the TUG we represent. 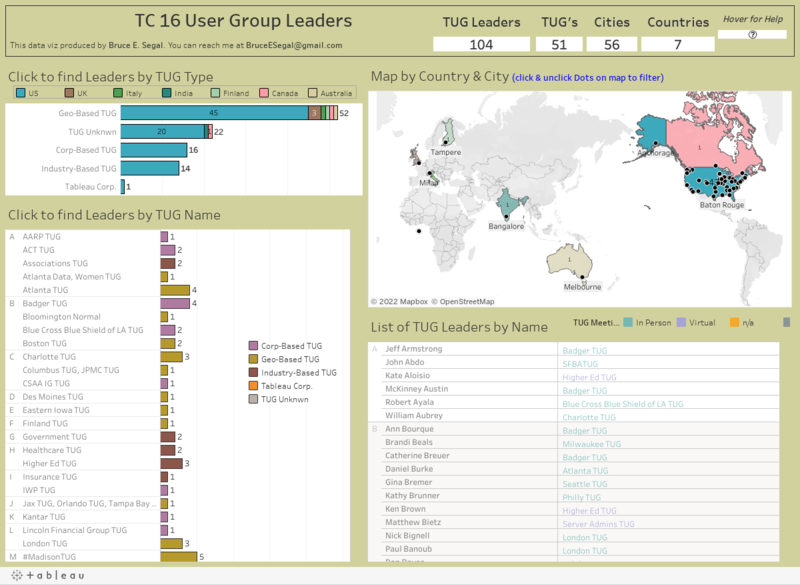 Here's a data viz on Tableau Public using that data. Here's, what I hope is, a little eye candy to entice you to feast on the interactive goodness. If you click the image, you will go to the viz, or right click it to open a new tab and stay in this forum. I’d be glad to sign up for this, I’m one of the leaders of the Healthcare TUG and co-lead the Maine TUG. Great. I'll send you the link to the google sheet a little later tonight. I'm still at the office. If you have time to update your data before the conference go ahead. Otherwise looking forward to meeting everyone.